When you hear the term "healing garden," what image comes to mind? If all you can imagine is a garden devoted to medicinal plants, consider this post an invitation to expand your definition. In the broadest sense, all gardens are healing gardens. Working in a garden, strolling through one, looking out a window into a garden - all have a calming, restorative effect on us regardless of what is planted there. Beyond that, gardens can be designed for specific purposes and healing effects. In the future, I plan to write expanded posts on some of these individually. For now, here are some general categories for you to consider. Pleasure Gardens. These gardens exist for one reason: to please the senses. They invite you to stop, rest and take in their beauty. They are an antidote to the high-stress, always-on, busyness of modern life. They bring the Feminine essence of "being" to balance the Masculine essence of "doing" in our world. A pleasure garden can be as simple as a single plant in a container that gives a person joy to behold. And it can consist of many elements including elaborate plantings, comfortable seating, and the sight and sounds of water. All that matters is the pleasure that the garden brings. Renovated Gardens. Most of the time when I think of healing gardens, I think of what gardens can give to us. But with renovation, it's all about us giving back to, and thus healing, the garden. I can't tell you how many times clients have told me that they didn't want to put money or effort into a certain, neglected part of their yard. "We don't like that spot and won't use it anyway," they say. I suggest that they might if the space was more functional and something they could enjoy. Sure enough, with some thoughtful renovation, those neglected areas often become the family's favorite outdoor room. Renovation typically involves restoring poor soil or paved-over "dead" zones and bringing them back to life. I'll never have a more dramatic "before and after" in my design career than the sunken garden we created in a space once occupied by a concrete, bunker-like structure. And anyone who has visited Butchart Gardens in Victoria, British Columbia, has seen what can be done with a used-up quarry. Medicinal Gardens. The science of pharmacology has its roots, literally, in the study of plant compounds and their effects on the human body. Relatives of these ruffly opium poppies, shown on the left, gave rise to an entire class of drugs, many of which are now produced synthetically, used to relieve pain. 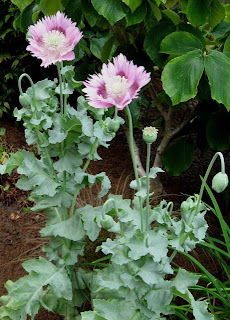 I'm not suggesting that you grow opium poppies. (I'm told that you would have to harvest acres of these seed capsules to get enough opium-laden latex to matter.) Just reminding you that the plant-medicine connection is a venerable one. As a further example, herbs have been cultivated, for thousands of years, in kitchen, convent and monastery gardens to be used to heal the sick. That tradition continues today as gardeners grow mint, basil, chives, chamomile, thyme and many other herbs, to use in cooking and making tea. As Hippocrates said, "Let your food be your medicine." To the category of medicinal gardens, I would add Therapeutic Gardens. In recent years, the value of gardens in the treatment of seriously ill patients has been recognized. Various studies have shown that patients who have a view into a garden recover more quickly, require less pain medication and, in the case of surgeries, have fewer post-op infections. Hands-on therapeutic gardens are being used in facilities for people who are chronically ill. Raised beds and specialized tools make it possible for people in wheelchairs to have the experience of gardening. Spending that time in the garden has proven to slow the progress of disease and give patients a greater sense of well being. Meditation Gardens. The health benefits of meditation have been well documented. And where better to practice meditation than in outdoor settings that are conducive to suspending the chatter that goes on in our heads? These places can be as informal as sitting under a big tree and staring out over water and as formal as a labyrinth designed for walking meditation. Chinese and Japanese gardens are also popular places for meditation. 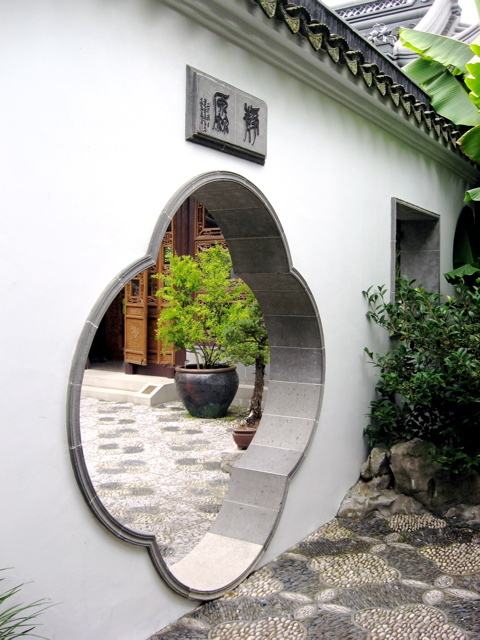 (A scene from the Chinese Garden in Portland, Oregon, is shown here.) Their clean, uncluttered lines and simple planting plans evoke a sense of peace. These gardens also feature small, somewhat hidden spaces, that allow the visitor some quiet and privacy. Community Gardens. Here in Seattle, perhaps the best known type of community garden is the P-Patch. Here people who have no place for a garden can rent a small plot and grow vegetables and flowers. Over the years, these p-patches have produced much more than food for the table. Friendships have been made, gardening tips exchanged and a sense of belonging to a community has been created. The healing effect is at least two-fold: gardeners benefit from the experience of gardening and connecting with the earth. And there is an additional healing effect that comes from building connections with other human beings. Memorial Gardens. These gardens offer a place of comfort for those touched by sorrow or tragedy. These can be small and very personal; I've had clients who have incorporated the ashes of loved ones into certain garden beds. When my clients work in that part of the garden, they feel like their loved one is there with them, which of course is true. And there are gardeners with memorial plants in their gardens: roses, peonies, hydrangeas, etc. that belonged to their mothers and favorite aunties. When those plants bloom each year, their flowers mean far more than any others in the garden. On the other hand, memorial gardens can be very large and carry symbolism for an entire nation. An example is the beautiful and moving Oklahoma City National Memorial, which commemorates the April, 1995, bombing of the Alfred P. Murrah Federal Building. The mission statement for this memorial states: "We come here to remember those who were killed, those who survived and those changed forever. May all who leave here know the impact of violence. May this memorial offer comfort, strength, peace, hope and serenity." Take a virtual tour of this very moving memorial here. I hope this overview of various healing gardens has given you a new way to look at gardens of all kinds. We humans need gardens. They, quite literally, ground us. They give us joy, pleasure, satisfaction and comfort. If you'd like to read more, I recommend "Healing Spaces: The Science of Place and Well-Being ," by Esther M. Sternberg, MD. We are having a particularly rainy and windy fall in the Seattle area this year, but don't let that keep you from enjoying the vivid colors of the season. 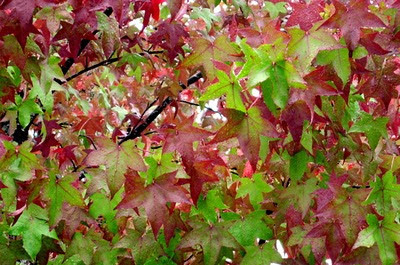 For example, look for two of my favorite trees for fall color: Sweet Gum (Liquidambar styraciflua) and Sourwood (Oxydendrum arboreum). Native to the eastern US, sweet gums are attractive trees that can grow to 60' tall, 20-25' wide. They are sometimes mistaken for maples because their leaf shape is similar. In fall, these leaves turn color in multiple shades: burgundy, red and yellow. Certain cultivars, such as 'Festival' and 'Roundiloba' are especially showy with bits of peach and orange mixed in with the purples, reds and yellows. These trees are stunning! If you are fortunate enough to pass one on your daily rounds, watch as the leaves progress through color changes as the days go by. They'll take your mind off the rain. Sourwoods are also native to the eastern US. They are much smaller than sweet gums, taking several years to reach a height of 20 - 30', making them good trees for urban yards. I don't think they are planted nearly enough here. They are well suited to our acid soils and cool summers. 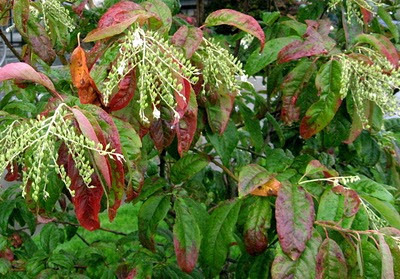 Sourwood leaves remind me of fruit tree leaves, like apples or peaches. But in fall, unlike the leaves on fruit trees, sourwood leaves turn brilliant red, orange and black-purple. The display is even more of a head-turner because in late summer, and early fall, these trees produce drooping clusters of white, bell-shaped flowers. 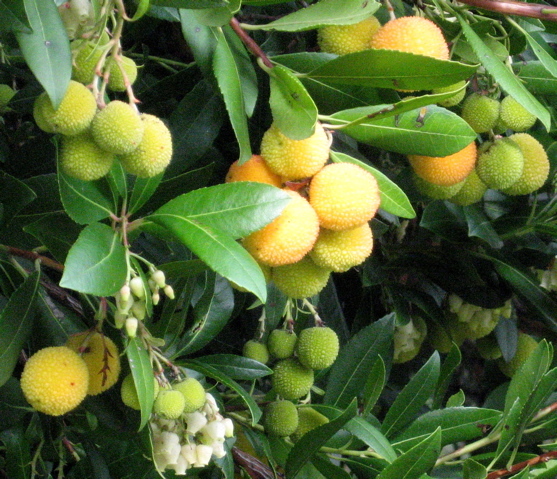 (They are in the same family, Ericaceae, as the Strawberry tree.) These flowers make sourwoods easily identifiable this time of year. They are said to be fragrant, so get up close; fall breezes quickly carry the scent away. In spite of rain and blustery weather, this is a good time to get outside and observe the change of seasons. In the Northwest, we are blessed to have a huge variety of trees with different growth habits. We have longer, more colorful autumns than other parts of the country because as one group of trees fades, another begins to color up. Most years, this means that we have close to three months of color. Enjoy it! If you live in the city of Seattle and need a good tree guide, consider Arthur Lee Jacobson's "Trees of Seattle: The Complete Tree-Finder's Guide to the City's 740 Varieties ." This book has become a classic, and for good reason. For most of my life, I have had problems with my back, left hip and leg. (I describe these issues, and the Birmingham hip resurfacing surgery I had in 2008, in this article posted on my other blog, Where I Am Now). But I love gardening and, in spite of pain and, later, serious disability, I refused to give it up. In fact, I would say that as my physical condition worsened, I needed the solace of my garden even more. The only question was, how to keep going? Over time, I found several things that made gardening possible, and easier, for me. Here are some of them. Raise the level of the garden. 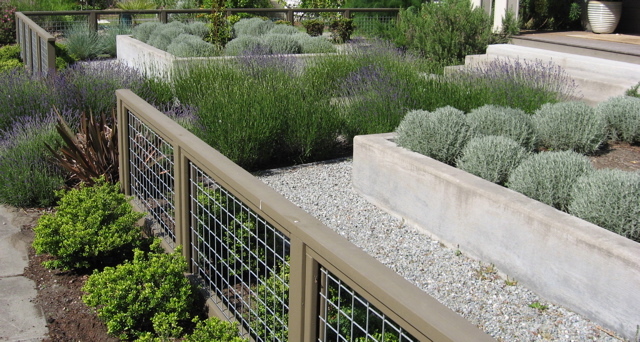 Raised beds bring the height of the garden up, so you don't have to bend down so far. 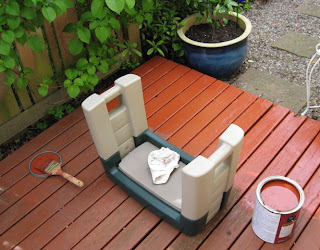 If building a raised bed is too difficult a project for you to manage, try containers. I grow nearly all my herbs in big containers just outside my kitchen door. I don't have to bend very far to reach them and they are always close by when I need fresh herbs for cooking. Use a kneeler bench . This item has been the greatest help to me of any tool I can think of both in the garden and for any household project that requires being on my hands and knees. I have to tell you, though, that I have almost never used mine as a bench. I flip it over and use it to kneel on. Knee pads are fine, but believe me, if you have trouble getting up and down, the "arms" on this kneeler make it so much easier. Being able to grab those arms and push myself up or lower myself down made the difference, for years, between being able to work in my garden and having to hire someone else to do it. The arms are good props, too, when your back is tired. Lean on one arm while weeding, raking or painting the deck. This saves your back and makes it possible to get more done in a session. Find tools that fit your hands and level of strength. I used to struggle with cheap pruners that were made to fit a man's hand. I have small hands, even by women's standards, and over-extending my reach constantly to use those pruners gave me terrible cramps. Then I discovered Felco pruners. They come in different sizes for different hands. And there is a model with rotating hand grips that make pruning easier for people with wrist and grip issues. I also am a big fan of my hori-hori knife , which is two or three tools in one, meaning I don't have to lug a bunch of stuff around with me when I garden. If you are using a cane, you know what I mean. When you have only one hand free to carry things, you want to be as efficient as possible. Another of my favorites is the hand rake . I have deep shrub beds and when I could only bear weight on one leg, raking standing up was an unwieldy project. I found that by positioning my kneeler in the bed and using the hand rake, I could easily get under and around shrubs and do just as tidy a job with less discomfort. Look for other tools at The Wright Stuff. They have a collection of ergonomic garden products designed for people with arthritis and limited mobility. Wear proper shoes. For years, I couldn't reach my left foot to tie a shoe. That meant that all my shoes were slip-ons. The problem with slip-ons, though, is that they are easy to walk out of, and that would cause me to lose my balance. This wasn't such a big problem indoors, but out in the garden where surfaces tend to be uneven, slip-ons could be dangerous. Then I discovered elastic shoelaces ! I simply replaced the regular lace on the left shoe of a good pair of walking shoes with an elastic shoelace and suddenly I had a safe, comfortable slip-on. The elastic laces stretch just enough to allow my foot to slide into the shoe then tighten up, nice and snug, to keep the shoe on and give me good support. If you have been gardening with a disability of one sort or another, what have your experiences been? I know there are many other helpful ideas and products out there. If you have some to share, please comment. Thanks. 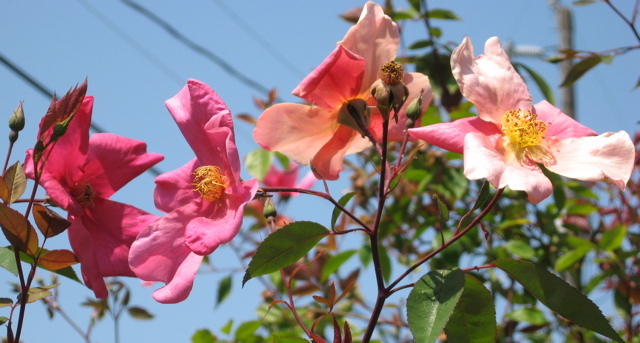 Botanically speaking, roses belong to the Rosaceae (ro-ZAY-cee-ee) family. This is a huge family, encompassing over 2800 species of plants, including fruit trees, shrubs, berries and, of course, roses. There isn't a single set of characteristics you can use to identify all members of this family, but there is one identifier that several genera share: a star-like shape at the base of the fruit. 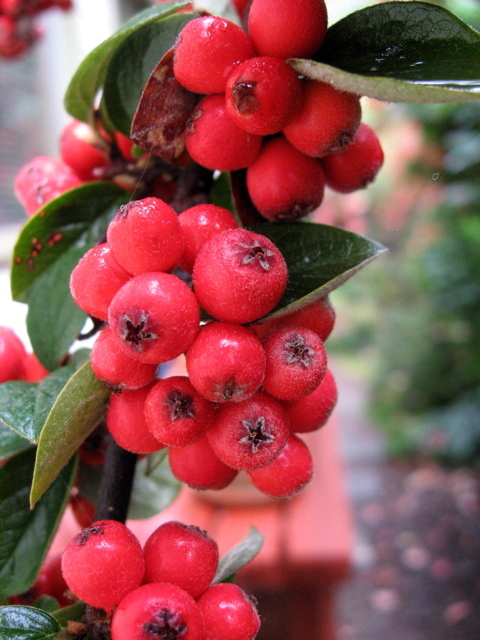 Here you see cotoneaster berries with those distinctive "stars" on the bottom. Once you know to look for this characteristic, you will begin to recognize other relatives in this family. These include: Hawthorn, Pears, Rowan, Cotoneaster and Pyracantha. 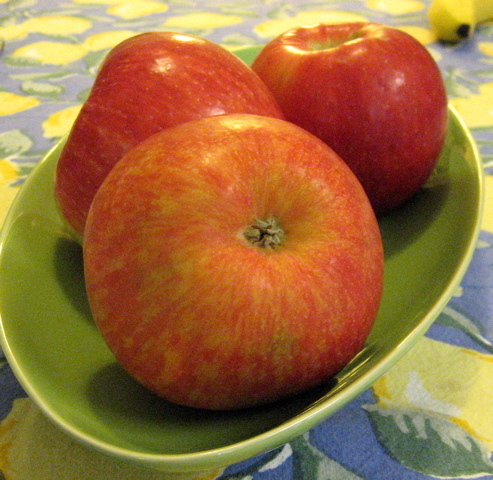 Fall is the best time of year for this, of course, because that's the season when these fruits are ripe. Here you see the "star" at the base of an apple, another rose relative. You'll find stars on the bottoms of pears, too. So there's your mini botany lesson for today. Now go out and do your own version of "star search." Is it a tree? Is it a shrub? With the right cultivar selection and a little artful pruning, it can be either. 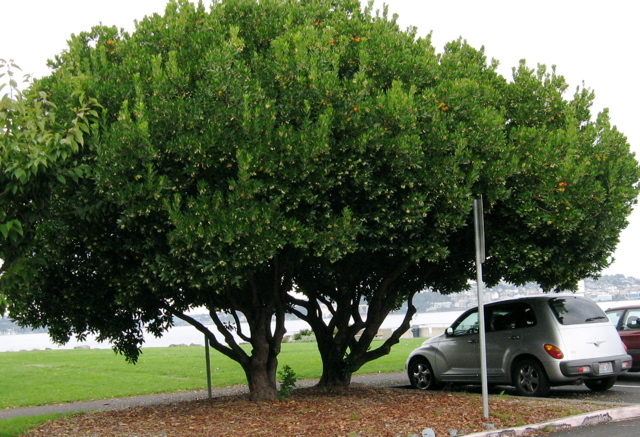 The standard species form of a Strawberry Tree (Arbutus unedo) can grow to nearly 30 feet tall and wide. If it is limbed up as it grows, it can look like this. If you want a smaller version, choose cultivars like 'Compacta', which will get to about 10' x 10', 'Oktoberfest' to about 8' x 8', or 'Elfin King' about 5' x 5'. Whichever one you choose, you will be rewarded with year-around interest. Strawberry trees have glossy, evergreen foliage. Large clusters of white, bell-shaped flowers appear in spring and, depending on availability of moisture, continue to bloom until fall. (The foliage, flowers and stems may look familiar to you if you live in the Pacific Northwest because strawberry trees are related to our native Madrone, Arbutus menziesii.) Flowers are followed in the fall by fruit that starts out looking like citrusy gum drops (see below). 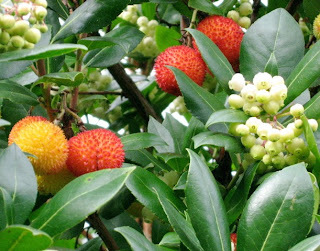 As it ripens, the fruit begins to look like strawberries; hence the name, strawberry tree. This fruit is edible, but bland. Even the birds will ignore it (an advantage from an ornamental point of view) until the tastier seeds and berries in the garden are gone. 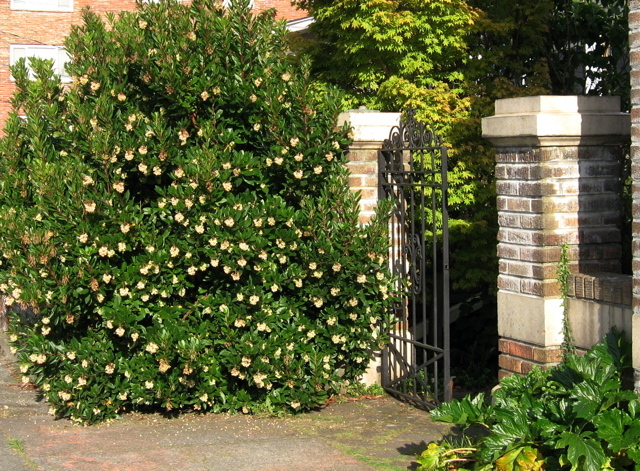 Strawberry trees are wonderful choices for small gardens. They aren't fussy about soil. You can choose a cultivar that will fit the space available. They will tolerate some shade, although, like most plants, will flower and fruit more readily in sun. They can be shaped easily with light pruning. 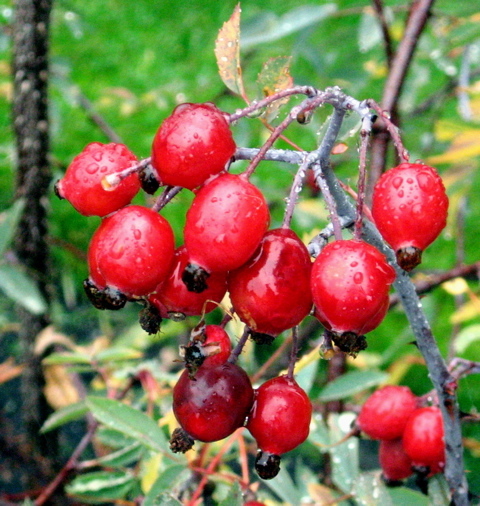 Strawberry trees in the Seattle area are particularly full of fruit this fall. They are a unique addition to the autumn color palette that is so spectacular and long-lasting in our area.